The Malwarebytes research team has determined that OneSoftPerDay is adware. 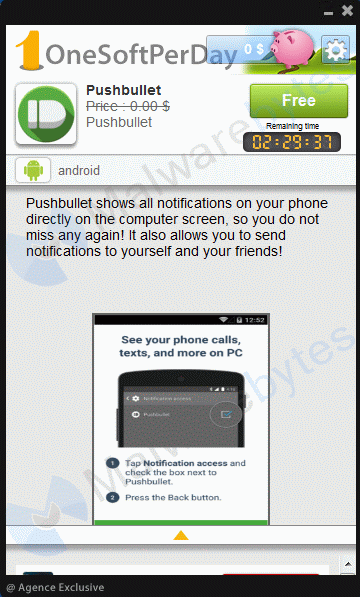 These adware applications display advertisements not originating from the sites you are browsing. How do I know if my computer is affected by OneSoftPerDay? How did OneSoftPerDay get on my computer? How do I remove OneSoftPerDay? Is there anything else I need to do to get rid of OneSoftPerDay? 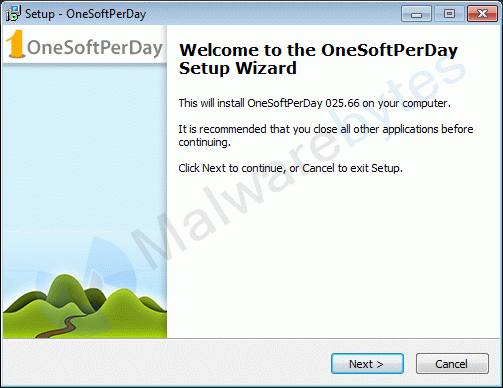 No, Malwarebytes' Anti-Malware removes OneSoftPerDay completely. As you can see below the full version of Malwarebytes Anti-Malware would have protected you against the OneSoftPerDay hijacker. It would have warned you before the rogue could install itself, giving you a chance to stop it before it became too late. O4 - HKLM\..\Run: [ospd_us_66] "C:\Program Files\ospd_us_66\ospd_us_66.exe"
"Inno Setup: App Path"="REG_SZ", "C:\Program Files\ospd_us_66"
"Inno Setup: Icon Group"="REG_SZ", "ONESOFTPERDAY"
"Inno Setup: Setup Version"="REG_SZ", "5.5.4 (a)"